In the early 1990’s, Lan Tec was mostly a distributor of wire and cable and related products serving the Dallas-Ft. Worth, Texas, area, but over the years we extended our reach to customers of various value added needs reaching outside the boundaries of Texas to all parts of the USA and to foreign countries as well. These value added needs include the custom design, assembly and testing of copper and fiber cables for projects providing an array of commercial and military uses. Some projects have required our expertise to provide consulting services, site surveys, detailed analysis of materials and labor requirements, design implementation and installation of high-speed communication networks. We have also been instrumental in serving some of our larger customers with finished parts kitting and inventory management. These capabilities have necessitated a reliance on vendor relationships that furnish us with more than parts suppliers. They require partnerships with companies that meet or exceed high quality, cost effective products and services demanded by the rigorous requirements of our customer base. This necessitates relationships with partners in foreign as well as domestic markets which provide Lan Tec with the ability to respond to an ever changing market place. 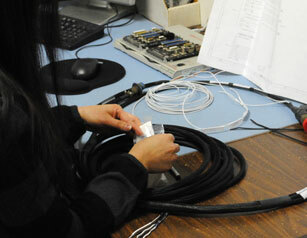 Lan Tec has always been a leader in the market place it serves because of its commitment to service and quality. We have met the challenges of this market place by implementing the highest standards for our quality control and making sure we respond with preventive and corrective action to achieve the best results for our customers. It is not enough to meet the quality standards of the market place. Lan Tec must exceed them. There is no other way to achieve the customer satisfaction Lan Tec desires. Our purpose and motivation is to serve the customer to the best of our ability. To this end we must achieve in order to view ourselves as a successful company.